ASUS have made a sport of building every piece of hardware, peripheral, and build under their ROG brand. Today, we test their top end CPU cooler, the ROG RYUJIN 360. ASUS make basically everything for their ROG series, enticing you to run a complete system in ROG colors, design, and logo everywhere. 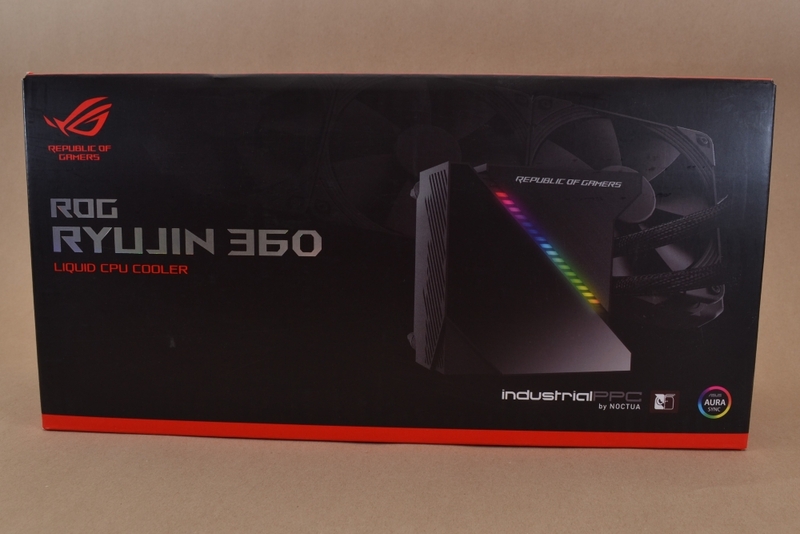 Today, we’re looking at one of their coolers, the Ryujin 360 AIO water cooler. The water cooler arrives in a lovely large box in the classic black & red ROG design. Classic choices here, name and product pic on the front, specs on the back. Everything is well protected inside. The package contains the ROG Ryujin 360 liquid cooler, three Noctua NF-F12 iPPC 2000 PWM fans, an accessory pack with screws and brackets, a pre-appled thermal compound, and, of course, a quick start guide. Let’s start by looking at the radiator. It is a classic and plain Asetek radiator without any fancy design. The pump head at the other end of the two tubes is slightly larger than the standard. It is accompanied by a cover plate that provides a bit of visual delight when everything is mounted and installed. The fans are from Noctua, more specifically from their industrialPPC line. They go 2000RPM. The noise level is just below 30 dBA at full speed. 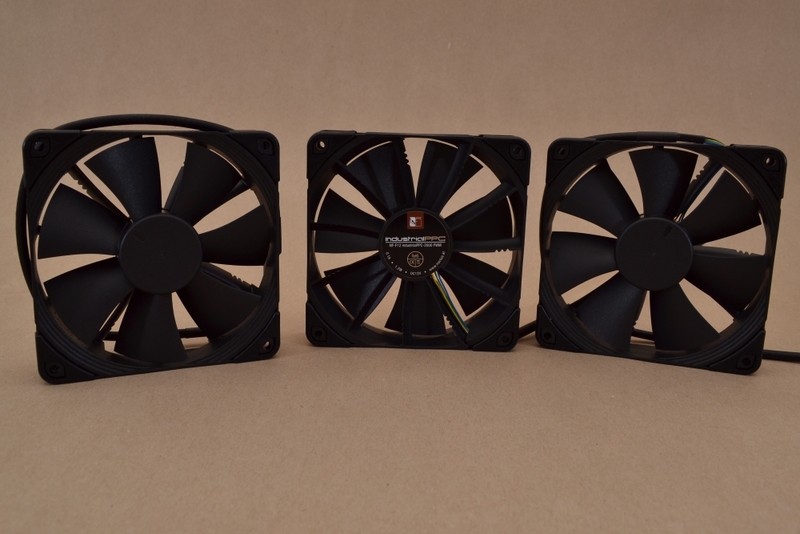 These fans are made to run 24/7, and they are black all the way through. Two plusses in my book. 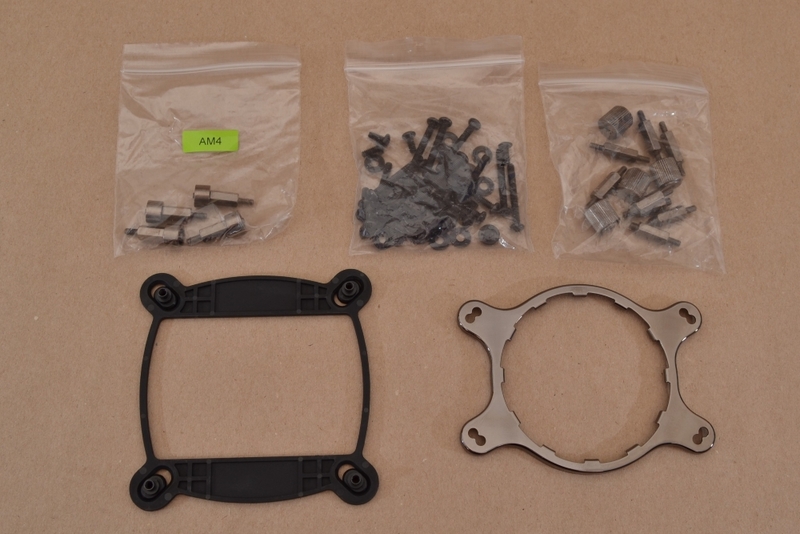 Of course, you get a whole lot of mounting accessories for all the newer CPU sockets from AMD and Intel. The radiator itself is rather slim, only 27mm. The connections are equally slim, only 7.5mm wide. They look a bit fragile, although I have never seen one break. But the tubes themselves are 11mm wide, so it looks a bit … strange. I’m looking forward to seeing how this radiator will perform. 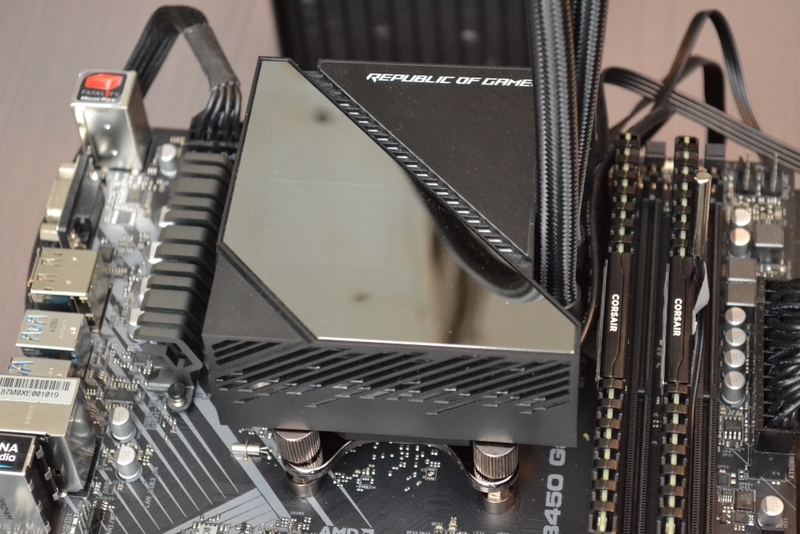 The cooling head is plastered with built-in cables, in total four of them. 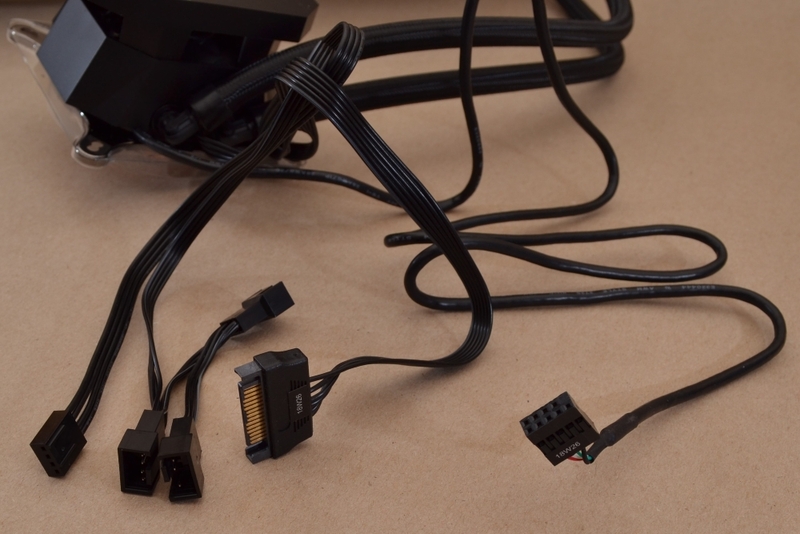 They are USB, SATA power, fan connection for the motherboard, and a fan splitter for the Noctua fans. If you have the largest and baddest cabinet in town, you might find these wires a bit short, however. The USB cable might be the only one that makes it. 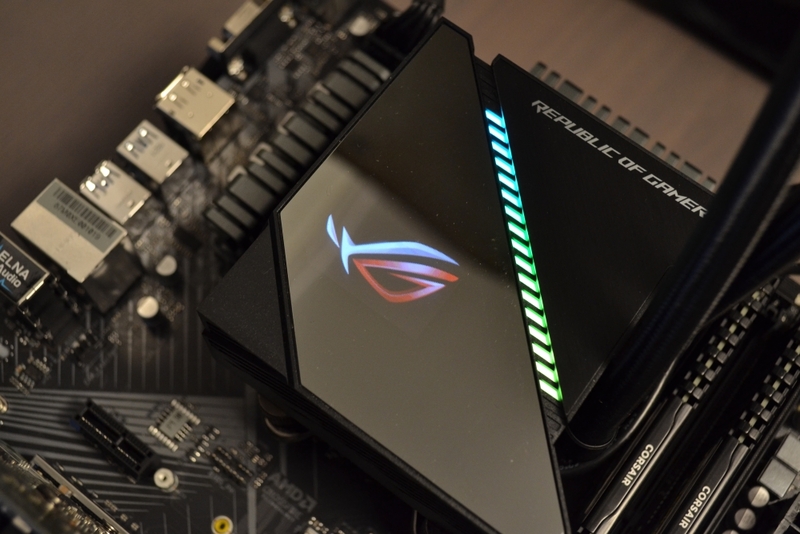 ASUS have pre-applied cooling paste, which has its pros and cons. On the upside, you have the right amount, and it is evenly applied. On the downside, you can only mount the cooler once. 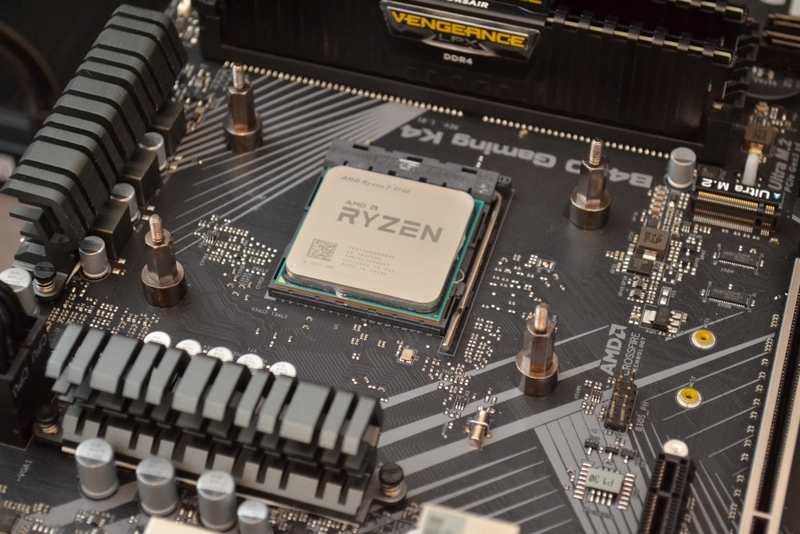 For this CPU cooler test I am using an AMG AM4 motherboard with an AMD Ryzen 2700 CPU. The cooler was extremely easy to mount on top. I used the original fittings on the flip side of the motherboard. You mount the cooling head over you CPU and fasten it with the four included thumb nut screws which you can tighten with a screwdriver. Finally, you place the cover on top of the unit. Two powerful magnets hold it tight, so installation is incredibly straightforward. 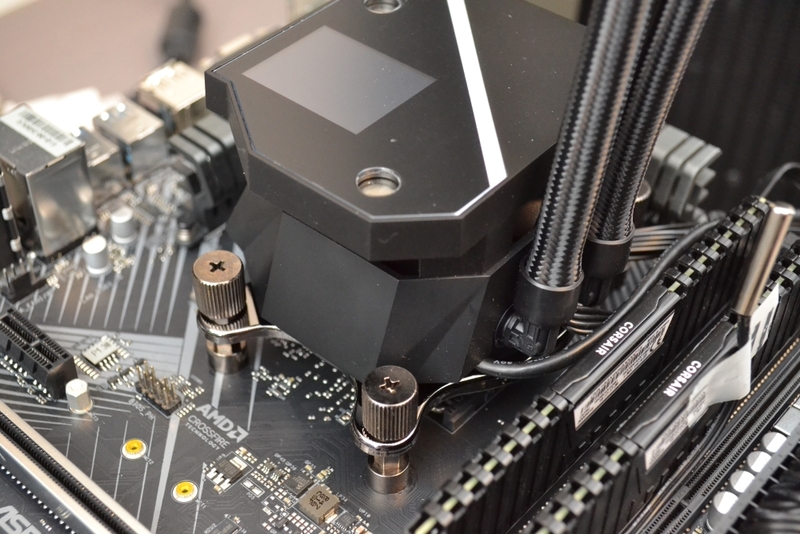 Time to get to know this AIO water cooling system a little better. Before we go to benchmarking, let’s look at the options you have of customizing the thing. To my surprise, I can only test this cooler on standard settings. I can control absolutely nothing from neither software nor motherboard. “Why?” you might ask. Because I’m not using an ASUS motherboard. 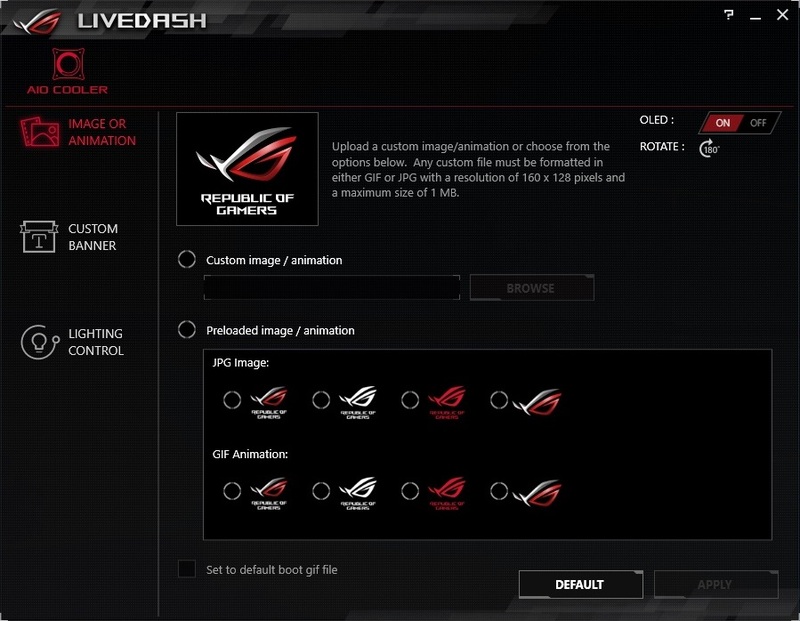 I can only get access to ASUS Livedash, a firmware for controlling the display and RGB light on the cooling head. The light on the cooler is a thin illuminated stripe sitting diagonally across the cooling head. You can apply a variety of effects to this. The small OLED display can show static images or GIF animations. It looks neat. Again, if I’d had an ASUS motherboard, the display would’ve been able to show some stats, such as temperatures and fan speeds. But no candy for me. 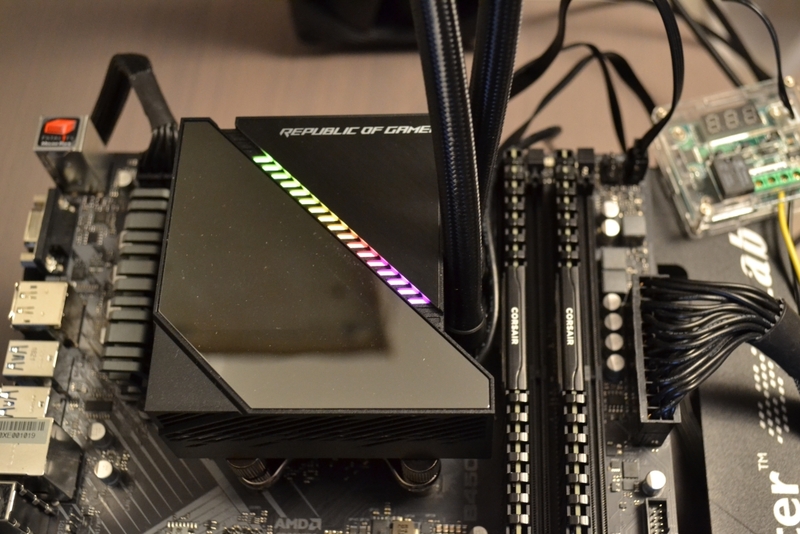 The standard startup procedure for our liquid cooler tests is giving the system a warmup of a 30-minute stress test with CPU-Z. After the warmup we run for another two minutes while measuring the temperature with HWiNFO64. Finally, we deduct the room temperature and land on a delta temperature giving a result that is as close to objective as we can get. Fans and pumps are usually set to maximum speed. This gives us an indication of the full cooling capacity of the cooler, whatever we are throwing its way. I ran this test on a non-ASUS motherboard. Due to their self-imposed limitations, I was not able to set fan and pump speeds at 100 percent. 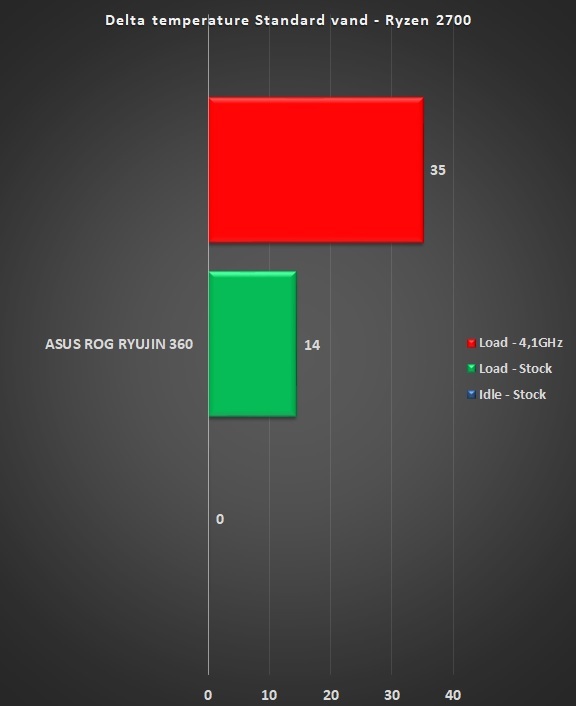 However, the ASUS ROG Ryujin 360 had no trouble cooling our test CPU. Not even during overclocking. A generally impressive result. Again, the cooler ran on auto speed during the whole test. I couldn’t adjust anything to 100%. Which was good for my ears, because those Noctua fans can produce some serious noise when going full steam. My estimate is that the fans ran about half speed, maybe even less. The cooler was remarkably quiet. Of course, I was able to hear a whispering from the four fans – there is an extra fan in the cooling head giving extra air flow around the VRM and M.2. modules. The specifications state that this inside fan performs a max speed on 4800 RPM and a noise level around 31 dB. Overall, this cooler makes about as much sound as a ninja kitten on a cottony carpet. 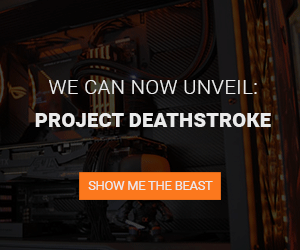 I’ll make the statement that you won’t notice any fans roaring once you close the cabinet and turn on the rest of your computer. 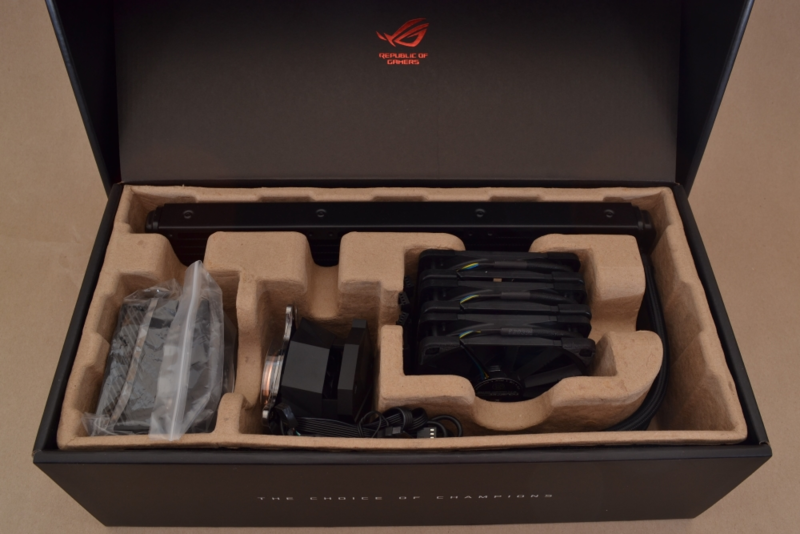 From a bird’s-eye view the ASUS ROG RUYJIN 360 is a bona fide solid liquid cooler. It keeps temperatures low without waking up your downstairs neighbors. The Noctua fans are some of the best quality you can buy, especially since they are from their industrial series. They maintain a high static pressure and provide a good airflow through the radiator. If that’s not enough, they are all black. And with black Chromax corners. For the color crusaders out there, you have the option to give your Noctua Chromax corners a little bit of unicorn sparkle by purchasing a red, blue, green, white, or even yellow alternative. The radiator is rather standard, and it is fitted with some sturdy, flexible fabric tubes that are extremely bendable without breaking. The cooling head and pump are merged into one larger pumping station. 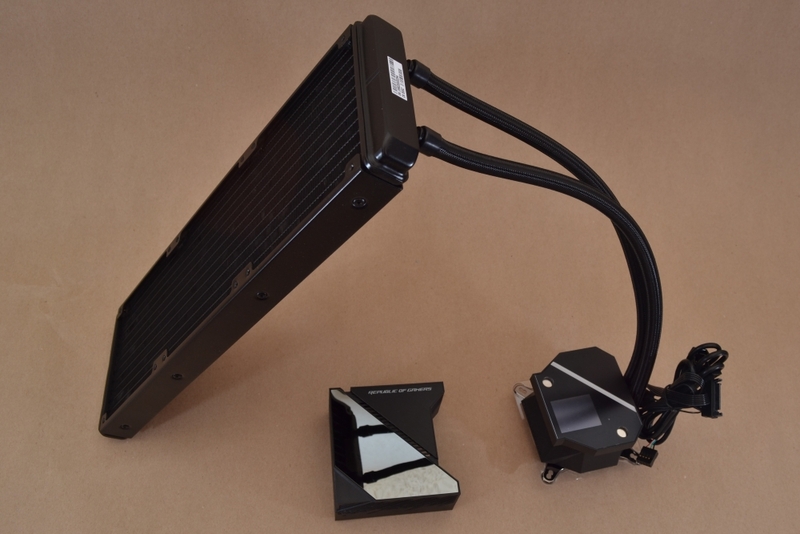 These are accompanied by a small fan that offers a bit of airflow to the motherboard components. This is well executed, and the overclockers out there will probably experience a performance boost. The vanilla lovers will probably not experience that much of a difference. The pumping station features RGB lights and a small OLED display that, under the right circumstances, can provide a good bit of relevant information and not just some Radiant Glowing Bling. What are those right circumstances, you might ask? Well, you need an ASUS motherboard to control basically anything. And this is a major caveat. Because you need to invest in more than the cooler itself to access even basic customizations. 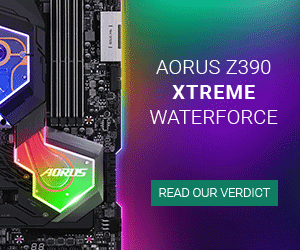 Trying to force you to buy other hardware is bad behavior by ASUS. A lot of the functionality is locked up in ASUS AI Suite which is tied to ASUS motherboards. I do not condone this, and I need to repeat it: If you DON’T have an ASUS motherboard, you have to make do with running the cooler on auto settings and changing basic stuff on the display. 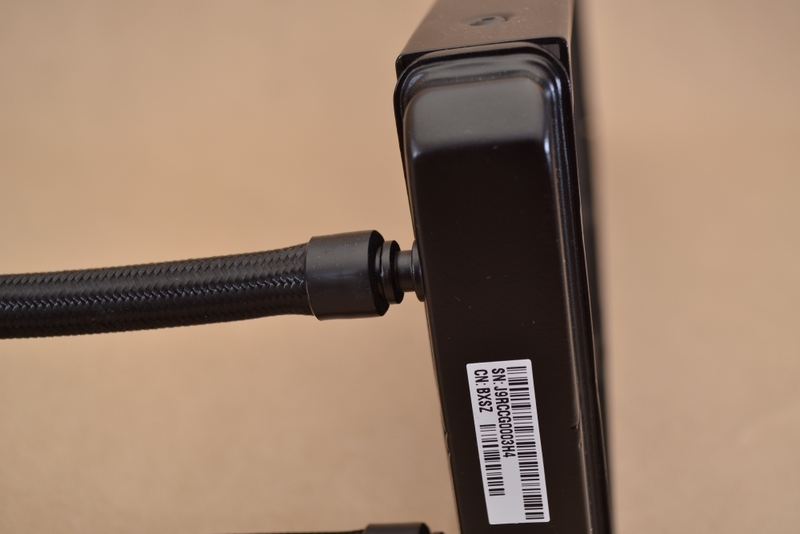 Another downside with the cooler is the length of the cables that emanate from the cooling head. This counts for the power and fan cables, at least. The USB cable does provide enough length to travel to the other side of the motherboard. Looking at the price of around $260, this cooler is high end. The ASUS ROG brand always comes at a price. To some this price is a bit too steep. I’m sure that anyone splashing their cash for a cooler like this don’t do it for performance only. They also consider extra features (read visuals) and ASUS ROG in general. Kind of like the iPhone fan boys.